One of the longest debates between scientists has been over Pluto. Is it a planet? A dwarf planet? Some third option? In 1902, Percival Lowell, an American astronomer, predicted the existence of a planet beyond Neptune from the distortions in the orbits of Neptune and Uranus. He began an unsuccessful search for this planet in 1905. Then in 1930, Astronomer Clyde W. Tombaugh discovered the planet using Lowell’s estimations as a guide. The discovery was announced on March 13, 1930. The name “Pluto” was given to follow the tradition of naming planets after Roman Gods. The ‘PL’ are also thought to signify the initials of Percival Lowell. Back in 2006, the debate over Pluto’s status as a planet seemed to have been settled by California Institute of Technology astronomer Mike Brown (who has affectionately taken the nickname “plutokiller”). His work on discovering Eris (a planetoid with more mass than Pluto), as well as many other Trans-Neptunian Objects convinced most of the Scientific Community that Pluto should be classified as a dwarf planet. However, on July 14, NASA’s New Horizons spacecraft made a flyby of Pluto and took many High Definition images of Pluto and its moons, and those images have rekindled the old debate. The images, taken by the Long Range Reconnaissance Imager (LORRI), show complex geological features, give information on Pluto’s atmosphere, and detail its moons. The images will be arriving periodically for over a year (To see the full gallery, click here). The most noteworthy parts of the images show a wide array of complex geological features, ranging from apparently wind-blown dunes and large valleys to nitrogen ice flows. As Jeff Moore, leader of the Geology, Geophysics and Imaging Team puts it, “The surface of Pluto is every bit as complex as that of Mars”. This complexity may help Pluto’s planetary bid as a rich geological history that is a part of most known rocky planets. Arguable, the most impressive feature is the evidence of wind-blown dunes, which suggests that Pluto may have had a thicker atmosphere in the past. It was also discovered that the atmospheric haze around Pluto has more layers than expected, to the point where it creates a twilight effect that illuminates the surface. The LORRI also took images of Pluto’s moons to reveal a similar turbulent geologic past. 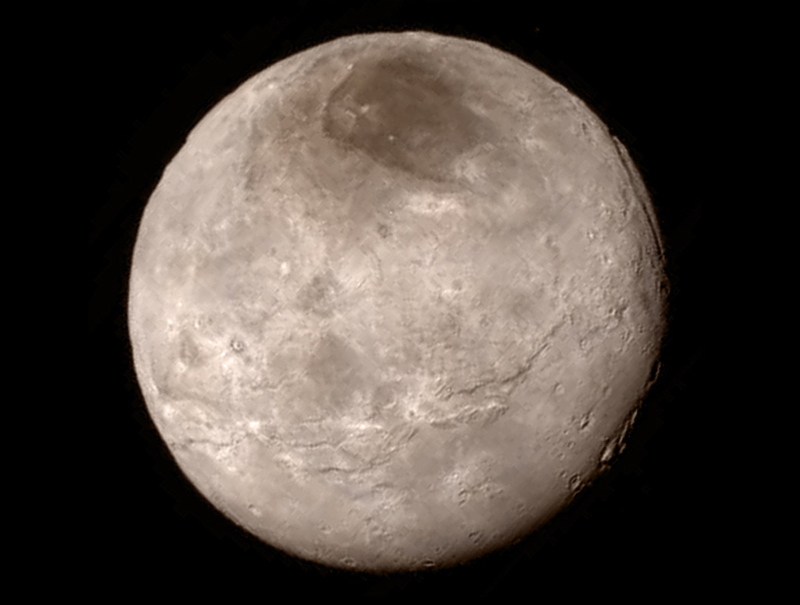 The largest moon, Charon, has been given special interest for two reasons. First, the surprising lack of craters suggests that the moon has been recently reshaped by internal geological forces. The second anomaly of note is the mysterious red hue near its northern pole. In a recent NASA blog, Carly Howett, a senior researcher at the Southwest Research Institute, has speculated that the red hue may actually result from the rapid deposition of gases from Pluto’s atmosphere because of the near absolute zero temperatures on Charon. Solar radiation would then alter the Nitrogen, Methane, and Carbon monoxide solids into compounds known as Thiolins. This type of atmospheric gas exchange has only previously been observed in binary planet systems. In fact, some even consider Pluto and Charon to be a double planet system because they orbit around a point in space that is not contained in either body, which would make New Horizons the first mission to a double planet. So, what exactly is the debate about? The International Astronomical Union’s definition of a planet includes three main criteria: the planet must orbit a sun, have enough gravity to be round, and be large enough to clear its orbit of debris. In 2006, the discovery of multiple Kuiper Belt objects, including Eris, caused Pluto to fail the third requirement. The latest information from the New Horizons spacecraft has created the entirely new argument that size does not matter once the object becomes spherical. Alan Stern, New Horizons Principle Investigator, and Mark Sykes, Director of the Planetary Science Institute, both attest that once an object is large enough to have significant geological events, it should be classified as a planet. They reject the IAU’s definition due to their belief that it focuses too much on the surroundings of the object and not its intrinsic properties. One argument is that if Earth was located in Pluto’s orbit, it would not qualify as a planet because the overwhelming amount of Kuiper Belt objects would continue to impede its orbit. In addition, the IAU’s definition was created specifically to apply to our own system, and that standardization and consistency are impossible for the billions of exoplanets in our galaxy. However, others still believe that Pluto’s impressive phenomena doesn’t qualify Pluto as a proper planet. As planetary scientist Carolyn Porco points out, “Comets have similar atmospheres and asteroids have moons.” Thus, the fact that Pluto has these features does not mean its classification should change. Mike Brown points out that to an outside observer that the solar system has 8 large bodies and hundreds of smaller ones. His argument is that if we made Pluto a planet, all other similar Trans-Neptunian Objects would also have to be classified as planets.